Recently I've been feeling a bit neglectful in my mom duties as I haven't helped her sew anything in a long time. I really want my daughters to grow up knowing how to sew and love it as much as I do. That can only happen if we sew together often, right? I guess that means I need to be better about finding more projects we can do together. 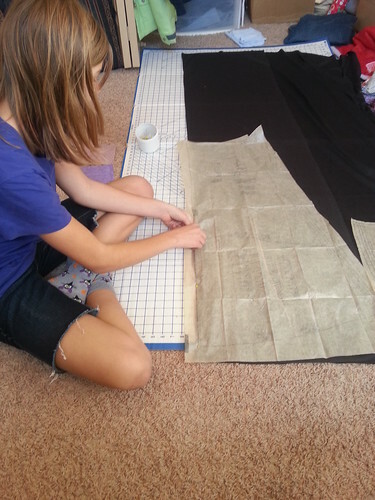 So with all that in mind, her and I set out to make a maxi skirt. Sewing it Herself, a photo by simple girl, simple life on Flickr. Knowing she has a short attention span we picked an easy pattern. This one from Simplicity was perfect. It consists of exactly 3 pieces: a front, a back, and a waistband. Perfect! Simplicity 1616, a photo by simple girl, simple life on Flickr. She sewed up all the sides and I serged the raw edges and finished the hem. She did a great job! We were able to start/finish the skirt in one afternoon. A Finished Maxi Skirt, a photo by simple girl, simple life on Flickr. She's growing up way to fast if you ask me! ***We made the skirt exactly as the pattern. For my daughter, who is about 5' 6", the finished skirt hits right about her ankles (skims the top of her foot). I am a bit taller than her so I would've lengthened it a few inches so that it would almost drag on the floor. We love this pattern too and she did a great job on it. Thank you for your inspiration. I needed a weekend project with my daughter - she is 12. Your daughter looks wonderful in her skirt. Beautiful girl! I just found a picture of her from her 3rd or 4th birthday. Sweet memories!